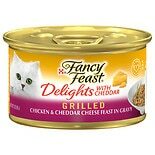 Shop Purina Fancy Feast Delights Gourmet Cat Food (3 oz. )3 oz. Meet the nutritional needs of your felines and delight them with savory flavors by feeding them cans of Purina Fancy Feast. Keeping a supply on hand helps you ensure that your pets remain happy and healthy, and purchasing them in larger quantities can also help save you money. Canned cat food can serve as a nutritious daily supplement to dry cat food, and it can also help your kitten make the transition from milk to solid foods. Simply read the label on Purina Fancy Feast to determine the appropriate amount and feeding schedule for your pet's individual needs. This cat food is available in a variety of flavors, including salmon and chicken, making it easy to satisfy a cat that enjoys a dietary assortment. Each type offers balanced nutrition and is formulated to meet the dietary guidelines for cats, so you can rest assured knowing that your pet is receiving the nutrients needed for healthy growth and development. Purina Fancy Feast is ready to eat and available in easy-open cans, so you need only pop the top off this pet food and scoop it into a dish. No other preparations are needed. This cat food can also be refrigerated, which allows you to serve the food in equal measurements throughout the day without any waste. Consider pairing Purina Fancy Feast with dry cat food and cat treats to satisfy your cat's appetite and taste buds.